A new fault in SEAMEWE4 and IMEWE, the submarine cables that connect Pakistan to the rest of internet, has caused tremendous speed reduction across the country. One fault was spotted in the SMW4 cable located near Karachi while another in the IMEWE near Egypt. Both faults resulted in slower internet speeds across Pakistan. The fault has affected both the landline and 3G/4G users. 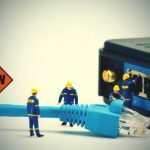 A loss of 288 Gbps, out of the total 360 Gbps bandwidth that Pakistan receives, is currently being faced while work is underway to fix both faulty cables. South East Asia Middle East Western Europe 4 (SEMEWE4) that connects Pakistan to the rest of internet. India-Middle East-Western Europe (IMEWE) submarine cable is an ultra high capacity fiber optic submarine cable system which links India & Europe via Middle East.This 3 fiber pair system with total length of approx. 12,091km is well complemented with 09 teminal stations forming a consortium of 09 leading telecom carriers from 08 countries. – Source: imewecable.com. Route for IMEWE (India-Middle East-Western Europe) that connects Pakistan to the rest of internet. Pakistan Telecommunications Company Limited, which is the leading ISP in Pakistan, has announced in a press release that it is taking immediate steps to solve this issue. This is not the first time Pakistan has faced such slow internet speed. In the past, the country was plunged to low bandwidth transfers due to damaged undersea and submarine cables. Pakistan has a huge internet userbase and it’s ranked among top ten online work forces in the world. It is certain that bloggers, freelancer and many internet based business are going to get affected. The IMEWE cable is going to take a day or two to get repaired while SEMEWE4 will take at least a week to get fully functional.